No one likes to pay taxes. But taxes are the law. 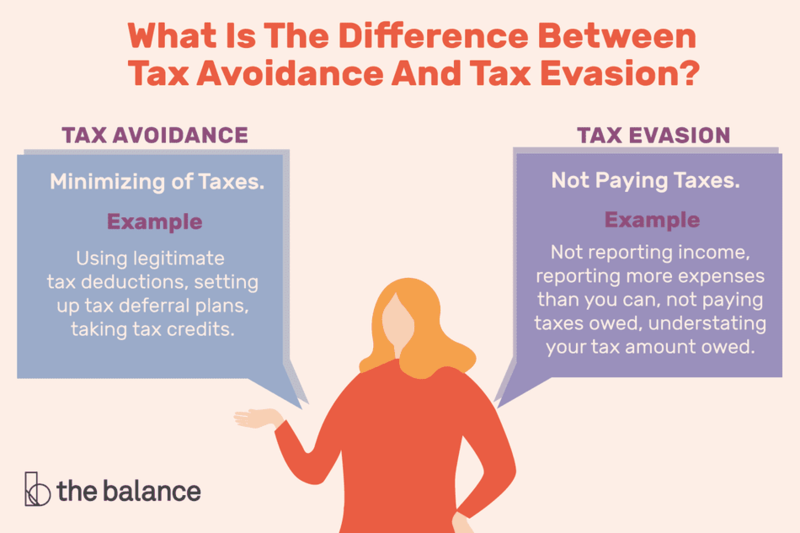 The terms "tax avoidance" and "tax evasion" are often used interchangeably, but they are very different concepts. Basically, tax avoidance is legal, while tax evasion is not. Businesses get into trouble with the IRS when they intentionally evade taxes. But your business can avoid paying taxes, and your tax preparer can help you do that. Tax avoidance is the legitimate minimizing of taxes, using methods included in the tax code. Businesses avoid taxes by taking all legitimate deductions and by sheltering income from taxes by setting up employee retirement plans and other means, all legal and under the Internal Revenue Code or state tax codes. You may have heard of "tax shields" These shields are for protection against higher taxes, and they are the strategies that make up tax avoidance. Taking legitimate tax deductions to minimize business expenses and thus lower your business tax bill. Setting up a tax deferral plan such as an IRA, SEP-IRA, or 401(k) plan to delay taxes until a later date. Taking tax credits for spending money for legitimate purposes, like taking a Work Opportunity Tax Credit for hiring workers in your business. "technicality that allows a person or business to avoid the scope of a law or restriction without directly violating the law." Since the tax code is so complex, savvy tax experts have found ways to lower taxes for their clients without breaking the law, taking advantage of parts of the law. Some tax loopholes are deliberate on the part of lawmakers; accelerated depreciation is one example. Note the word "avoid" in the definition; finding a way to avoid paying taxes by finding a hole in the tax code is tax avoidance, not evasion. Just be aware that there are some gray areas in the law. Getting a competent, honest tax expert can save you from going over the line to tax evasion. Tax evasion, on the other hand, is the illegal practice of not paying taxes, by not reporting income, reporting expenses not legally allowed, or by not paying taxes owed. In this situation, the phrase "ignorance of the law is no excuse" comes to mind. These taxes are called trust fund taxes, because they are given in trust to a business, with the expectation that they will be turned over to the appropriate state or federal agency. Failing to pay employment taxes to the IRS and sales taxes to a state taxing authority and other federal, state, and local taxes can mean high fines and penalties. In fact, tax evasion can be practiced on all the taxes a business owes. It's considered tax evasion if you knowingly fail to report income. Substantially understating your taxes (by stating a tax amount on your return which is less than the amount owed on the income you reported). Failure to withhold/pyramiding: An employer fails to withhold federal income tax or FICA taxes from employee paychecks, or withholds but fails to report and pay these payroll taxes, as described above. Employment leasing, which the IRS explains is hiring an outside payroll service that doesn't turn over funds to the IRS. Paying employees in cash and failing to report some or all of these cash payments. Filing false payroll tax reports or failing to file these returns. Here are some other tax mistakes business owners make that are considered tax evasion. This is not an exhaustive list, but just a sample of the kinds of tax-evasion strategies the IRS is on the lookout for. Tax fraud is basically the same as tax evasion. Fraud can be defined as "an act of deceiving or misrepresenting," and that's what someone evading taxes does — deceiving the IRS about income or expenses. While tax evasion might seem willful, you may be subject to fines and penalties from the IRS for tax strategies they consider to be illegal and which you were unaware you were practicing. The best way to avoid being charged with tax evasion is to know the tax laws for income taxes and employment taxes. For example, knowing what deductions are legal and the recordkeeping requirements for deductions is a big factor in avoiding an audit. For employers, knowing the payroll tax reporting and payment requirements will help keep you out of trouble. Get an honest, careful tax professional to help you with your taxes. Listen to your tax preparer and keep excellent records of all income and expenses, even if you have a cash-based business. And keep reading articles from this site and others, to learn more about what constitutes tax evasion. Some tax evasion cases may be reviewed in tax court, but others are turned over to the IRS criminal division or to a state or local taxing authority for prosecution. Even if the taxpayer is eventually found not guilty, the costs in time and money are enormous. Since tax evasion is considered intentional and "willful," the IRS can bring criminal charges against those convicted of tax evasion. The penalties can include jail time as well as substantial fines and penalties. This page from the IRS on the penalties for tax fraud is a sobering reminder of the cost of attempting to cheat on taxes.